Provide comfort for the family of Roger Lane with a meaningful gesture of sympathy. 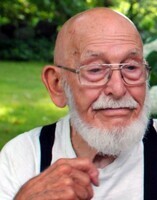 Roger Nathaniel Lane was born at the Lane Farm in Fayette, Maine on 28 Jun 1922 to Emery Orson Lane and Rose Mabel Haskell; he died at age 96 on Saturday 30 March 2019 at Sandy River Rehabilitation in Farmington, Maine. He graduated from Livermore Falls High School in 1940 and served in the United States Army Signal Intelligence Service [Southwest Pacific] from 1942-1946. Upon his return he worked at the Massachusetts Eye & Ear Infirmary, Boston, Massachusetts and lived for many years on Beacon Hill. He never married. In the 1980s, he retired and returned to North Jay, Maine. In 2003 he returned to live at the Lane Farm in Fayette where he resided until February. He was the record-keeper and Lane family historian for many years; with his cousin Frank C. Lane, he co-wrote Ancestry and Descendants of James Lane of Hingham, Massachusetts published in 1966. He was a member of the Readfield, Fayette, and North Jay Historical Societies, the North Jay and Readfield Granges, and the North Fayette Community Church. Mr. Lane was predeceased by his parents and his siblings: Jennie May, Wesley Orson, Gladys, Stella, Persis, Marion, Ronald Hayden, Muriel Arlene, and Eunice Ora. He is survived by many loving nieces and nephews, and their children and grandchildren. Funeral arrangements by FINLEY FUNERAL HOME, 15 Church Street, Livermore Falls, Maine. A public memorial service will be held at the North Fayette Community Church on Sunday April 28 at 11am; a celebration of his life will be held in conjunction with the annual Lane Stampede on Sunday, July 21 at Kineowatha Park in Wilton, Maine. In lieu of flowers, memorial donations can be made to: Randy Lane Scholarship Fund, c/o Mavis Lane, 390 Keep Road, Jay, ME 04239-4057; or, North Fayette Community Church, c/o Gregory Soule, 32 Norcross Hill Road, Chesterville, ME 04938. To send flowers in memory of Roger Nathaniel Lane, please visit our Heartfelt Sympathies Store. Provide comfort for the family of Roger Nathaniel Lane by sending flowers. Please accept my deepest condolences for your loss. Please take comfort in the promise made by our loving God Jehovah and Jesus Christ. The guaranteed hope of seeing our loved ones again by means of the resurrection ( John 5: 28,29). May the thoughts and prayers of others and the many fond memories comfort you each day.